The Skolkovo Institute of Science and Technology (SkTech) plans to establish Russia’s biggest endowment fund, projected at 16.5 billion rubles ($560 million) in 2012 alone. The country’s biggest state-controlled companies will provide the money – they are required to transfer 1 percent of their innovation budgets to SkTech. Arkady Dvorkovich, economic assistant to President Dmitry Medvedev, said on March 20 that state-run companies will be required to transfer 1 percent of their spending on innovation development programs to the endowment fund of the Skolkovo Institute of Science and Technology (SkTech). He said the fund would finance SkTech’s entire research program, and that some of the research would serve the interests of the contributing companies. The Skolkovo Foundation and the Massachusetts Institute of Technology established SkTech in 2011. 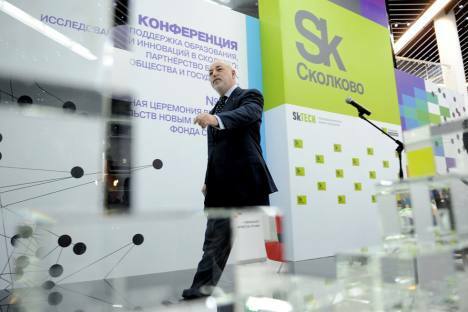 The institute will focus on not only education, but also research, according to Skolkovo Foundation President Viktor Vekselberg. Budget funds are now being used to construct the university building. Endowment funds became essential sources of finance for Western universities, museums and hospitals long ago. They are traditionally funded by donations from several philanthropists or companies. This money is invested in securities and the earnings are used to finance daily operations and research. Previously, a presidential commission had instructed Russia’s 47 biggest state-controlled companies, including Gazprom, Russian Railways, RusHydro, and Aeroflot, to invest money in innovation programs. In January, the commission instructed the government to make provisions for contributions to SkTech’s endowment fund amounting to 1 percent of the state companies’ innovation budgets, said Stanislav Naumov, Skolkovo vice president. “State representatives on boards of directors have initiated discussions of this mechanism and ways to allocate funds. All the procedures are expected to be completed by September,” Naumov explained. State contributors are expected to provide around 30 billion rubles ($1 billion) within three years, Dvorkovich said. In 2011-2015, allocations will amount to 58 billion rubles ($1.8 billion), according to Naumov. The endowment fund is projected to reach 16.5 billion rubles ($560 million) in 2012 – state companies are expected to provide 10 billion rubles ($340 million) and private partners of the Institute will donate the rest. SkTech plans to pursue a conservative endowment management strategy, with yield guidance yet to be identified, Naumov said. The return on investments may reach 15 percent of the fund, or up to 2 billion rubles ($68 million) in 2012, according to an unidentified source close to the fund. SkTech’s endowment fund will be Russia’s biggest. Russia’s endowment funds totaled an estimated 17.2 billion rubles ($600 million) as of early March 2012, according to Lyudmila Panteleyeva of Gazprombank Asset Management. The biggest fund to date belongs to the Moscow State Institute of International Relations (MGIMO), which has accumulated about 900 million rubles. SkTech still has a way to go to get closer to the world records. In 2011, the endowment of Harvard University, the biggest fund of this kind in the world, earned $1.2 billion, according to its annual report. Harvard’s endowment value rose 16 percent to $32 billion in the 2011 financial year. The world’s second-biggest endowment fund, that of Yale University, amounted to $19.4 billion during the same period, with spending from the endowment for the University’s 2011-2012 fiscal year budgeted at $992 million, or around 37 percent of its revenues. RusHydro said it was working on mechanisms for transferring funds, and the press service of Russian Railways reported that the company would comply with the authorities’ requirements. A spokesman for Gazprom said that it was familiar with the initiative, but it is not clear how the mechanism will be applied, for instance, which amounts should be used as the basis for calculating the required 1 percent, as Gazprom has a complex innovation development program. A source within one of the state corporations said that the companies are discussing the format for their involvement in the endowment fund with the authorities: the corporations are expecting some sort of haggling, or hope that at least some of the research to be financed from their funds will come in useful for them. State companies are enabled to conclude strategic partnership agreements with the Skolkovo Foundation and spell out the specific lines of research in which they are most interested, and Skolkovo will make them its priorities, Naumov said. “Anyway, we are interested in commercialization of our research, which is why we will respect business interests,” he added. For business to invest in an endowment fund is a chance to develop competencies in the research and educational system, which can increase their competitiveness. “New specialists will appear. We will be able to create and own technologies rather than import them”, he continues. For example, one of SkTech’s projects – the search for hazardous substances in luggage using of radiation technologies – reduces time taken for passenger checks, which is beneficial to both airlines and airports,” Naumov said. State companies could focus on investing in training new specialists on the condition that they employ them afterwards, said Leonid Gokhberg, senior deputy rector at the Higher School of Economics.